Fasihi, M., Arabzadeh, R., Moghbeli, M. (2017). Effect of silica particles on adhesion strength of polyvinyl chloride coatings on metal substrates. Iranian Journal of Chemical Engineering(IJChE), 14(2), 74-82. M. Fasihi; R. Arabzadeh; M.R. Moghbeli. "Effect of silica particles on adhesion strength of polyvinyl chloride coatings on metal substrates". 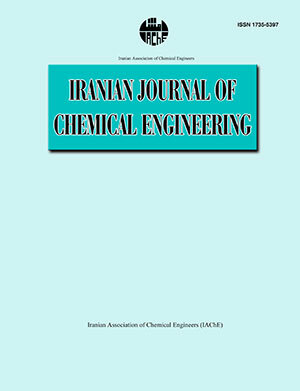 Iranian Journal of Chemical Engineering(IJChE), 14, 2, 2017, 74-82. Fasihi, M., Arabzadeh, R., Moghbeli, M. (2017). 'Effect of silica particles on adhesion strength of polyvinyl chloride coatings on metal substrates', Iranian Journal of Chemical Engineering(IJChE), 14(2), pp. 74-82. Fasihi, M., Arabzadeh, R., Moghbeli, M. Effect of silica particles on adhesion strength of polyvinyl chloride coatings on metal substrates. Iranian Journal of Chemical Engineering(IJChE), 2017; 14(2): 74-82. The aim of this study was to improve the adhesion performance of plasticized polyvinyl chloride (PVC) coatings on steel substrates by using nanoparticles. For this purpose, the PVC plastisol with different concentration of nano-silica was prepared and applied to bond steel joints. The adhesive strength of the joints was determined by single-lap shear test. Moreover, mechanical properties and microstructure of coating were investigated. The addition of 1wt% nano-silica to plastisol dramatically increased the lap shear strength up to 4-fold, which was an outcome of compatibilizing effect of silica. Young's modulus and tensile strength of plasticized PVC were slightly increased by adding nanoparticles, as well. The scanning electron microscopy (SEM) and atomic force microscopy (AFM) exhibited higher inclusion size in the coating having higher silica volume which was attributed to the agglomeration of nanoparticles. In the following, the effect of plasticizer composition on the adhesion strength by replacing some part of dioctyl phthalate (DOP) plasticizer with more polar oil, epoxidized soybean oil (ESO), was examined. Although adding ESO improved the lap shear strength of the neat coating, its effect on the properties of the coatings containing silica was negligible. Verdu, J., Zoller, A. and Marcilla, A., “Plastisol gelation and fusion rheological aspects”, J. Appl. Polym. Sci., 129(5), 2840 (2013). Nakajima, N. and Harrell, E. R., “Non-linear viscoelastic behavior of PVC plastisol”, Int. Polym. Proc., 20(1), 8 (2005). Wang, D., Parlow, D., Yao, Q. and Wilkie, C. A., “PVC‐clay nanocomposites: Preparation, thermal and mechanical properties”, J. Vinyl Add. Technol., 7(4), 203 (2001). Xie, X. L., Liu, Q. X., Li, R. K. Y., Zhou, X. P., Zhang, Q. X. and Yu, Z. Z., “Rheological and mechanical properties of PVC/CaCO3 nanocomposites prepared by in situ polymerization”, Polymer, 45(19), 6665 (2004). Madaleno, L., Schjodt-Thomsen, J. and Pinto, J. C., “Morphology, thermal and mechanical properties of PVC/MMT nanocomposites prepared by solution blending and solution blending + melt compounding”, Compos. Sci. Technol., 70(5), 804 (2010). Xie, X., Li, B., Pan, Z., Li, R. and Tjong, S., “Effect of talc/MMA in situ polymerization on mechanical properties of PVC‐matrix composites”, J. Appl. Polym. Sci., 80(11), 2105 (2001). Mohseni, M., Mirabedini, M., Hashemi, M. and Thompson, G., “Adhesion performance of an epoxy clear coat on aluminum alloy in the presence of vinyl and amino-silane primers”, Prog. Org. Coat., 57(4), 307 (2006). Chaudhury, M., Gentle, T. and Plueddemann, E., “Adhesion mechanism of polyvinyl chloride to silane primed metal surfaces”, J. Adhes. Sci. Technol., 1(1), 29 (1987). Wu, S., Polymer interface and adhesion, Taylor & Francis Group, New York, USA, p. 302 (1982). Ebnesajjad, S. and Ebnesajjad, C., Surface treatment of materials for adhesive bonding, William Andrew, Norwich, USA, p. 224 (2013). Ebnesajjad, S. and Landrock, A. H., Adhesives technology handbook, William Andrew, Norwich, USA, p. 6 (2008). Silva, L. F. M. D., Öchsner, A. and Adams, R. D., Handbook of adhesion technology, Springer, New York, USA, p. 213 (2011). Starostina, I. A., Stoyanov, O. V. and Deberdeev, R. Y., Polymer surfaces and interfaces: Acid-base interactions and adhesion in polymer-metal systems, CRC Press, Florida, USA, p. 136 (2014). Conradi, M., Kocijan, A., Zorko, M. and Jerman, I., “Effect of silica/PVC composite coatings on steel-substrate corrosion protection”, Prog. Org. Coat., 75(4), 392 (2012). Najimi, M. R. and Bajgiran, E. R., “The enhancement of PVC-epoxy adhesion to metal surfaces”, M.Sc. Thesis, Tehran University, Iran (1996). Chen, N., Wan, C., Zhang, Y. and Zhang, Y., “Effect of nano-CaCO3 on mechanical properties of PVC and PVC/Blendex blend”, Polym. Test., 23(2), 169 (2004).